Yeah, we decided we want all the treats, all the time. Or we'll turn you into a sock monkey and nobunny will ever know what happened to you. Ohhh nooo, not a sock monkey! Quick, Rachel, get them some treats and then start planning your veggie garden. These guys look like they'll want a lot of variety. Jen, this kind of contiguousness is known as plotting. 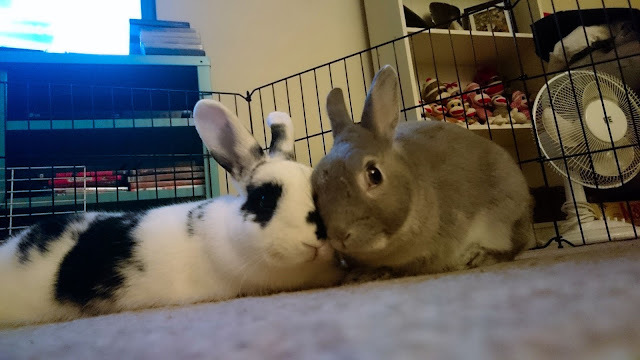 Cuteness does not usually have anything to do with the attacks being discussed, but bunnehs do not shy from exploiting their cuteness ruthlessly. I think Rachel is going to be safe as soon as someone has the courage to tell these two that they have been caught on the security cam. What would be so bad about being a sock monkey? "What is so bad about being a sock monkey?" RG, this is way past SUTTR, way past Stockholm Syndrome. This is going over to the dark side! Bunnies around the world are rapt with jubilation.